Bolted by Jacques Welter around 1990. The route hasn't seen any ascent until the 13th May 2012 when the german climber Simon Plum managed to climb the lower crux section an thus made the 1st ascent of Nikita! The german climber Daniel Jung, who already climbed 9a and 9a+, had given it many tries in 2011 & 2012 and was really close doing it. He estimated the grade around 8c or 8c+. 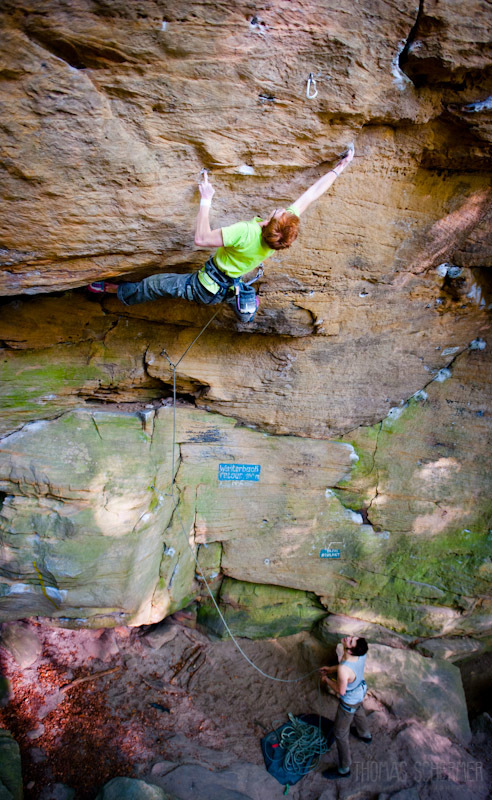 Simon suggested 8c now. We hope that there will be more ascents to follow. Nikita is the name of a movie produced by Luc Besson in the late 80's. climbing.lu: What do you think about the grade of Nikita? Simon: The hardest grade in which I have done more than one route is 8b. I can say that Nikita is definetly harder but this should be obvious anyway. I almost did an 8c in Frankenjura which is called New Orleans Heavy Weight Division and is similar to Nikita in its setup. It starts off with an Fb8a boulder that leads into a 7c route. Nikita has an Fb8a section as well followed by another boulderproblem around Fb7b, divided by a decent rest. The top section is around 7c too. The single moves are probably harder than the ones in the Frankenjura-8c, but the rests in between are way more comfortable. Long story short: it should be 8c I guess. climbing.lu: How many tries did you need to succeed or how many time did you spent on the route? Simon: Although it might sound strange I've got to admit that it took me only one and a half sessions to complete Nikita. I think that the key for my quick success was all the mental preparation I did in the two weeks before I succeeded. In my brief first session I got stuck in the same position over and over again, so I knew I had to change something. I've been thinking a lot about what I had to optimize and when I finally got the chance to try it again physically the puzzle was already solved in my mind. In this way I didn't waste any energy in misleading efforts. climbing.lu: Did you like Nikita? Simon: The beauty of the upper half of Nikita is out of question. The crux is some of the hardest and physically most demanding bouldering I have ever done. I've been fascinated by extremely hard single moves for the last 2 years in which I hardly ever touched a rope or runners. Finding those moves in an open project at my favourite crag and realizing that they are exactly on the fine line that marks the limits of my abilities was simply amazing and the whole experience on the route therefore one of the best ever! climbing.lu: Did you do some special training for the route? Simon: I knew that I had to strengthen my tendons for the mono in the crux. I started traversing on one or two fingers in the gym and stressed my tendons by using only my middle finger on easy boulders. But I tried not to overload and start doing this specific training very slowly. Still I felt like I already had improved this specific strenght after a fairly small amount of training. climbing.lu: What will your next projects be?